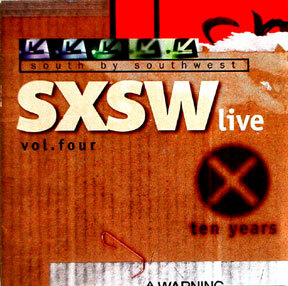 Probably almost everyone in the music industry throughout the entire world knows of SXSW, if you do not, check out their website. It is the 2nd or 3rd largest music conference in the world. It happens every year in the middle of march during spring break in Austin, Texas. It has been going on since 1986, when there was about 200 bands coming and has grown into music biz media fest with over 1,000 bands. It is probably the best ticket you can buy anywhere to see what is really going on in terms of new music and often features well known established acts like Tony Bennett or Iggy Pop. Thanks to the directors of SXSW current and past: Roland Swenson, Louis Black, Nick Barbaro and Louis Jay Meyers for giving it a shot though. The artists on these cd's loved getting them in their hands and that was a good moment of satisfaction for all of us who made them.